With many thanks to Alastair Graham-Campbell for sending in these pictures, it looks as though fun was had despite ‘trying’ conditions. He says:- I hope it is not too egotistical to send you a couple of pics but I have to admit to feeling honoured to have caught a 16lb Sea Trout with John Edey on Raffey Pool, Tillmouth on Tuesday 26/6/12. The first picture was a 7lber the night before on Upper Wellington-fly and returned. The second pic is of Michael motoring up to The Prop. The 3rd is the biggest sea trout I have ever caught! Well done Alastair and your face says it all! Keep them coming, we are always grateful when our subscribers take the time to send us mementoes of their visits. 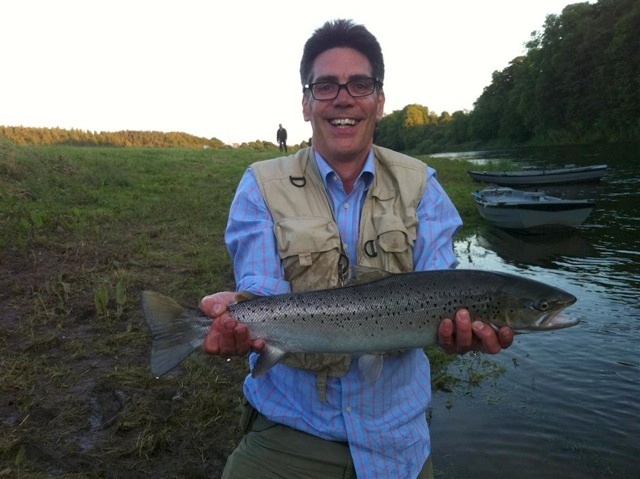 This entry was posted in Uncategorized and tagged Angling, boatmen, fishing, FishTweed, fly, gillie, River Tweed, salmon, sea trout, season 2012, spring salmon, Tillmouth, Tweed, Tweed Valley. Bookmark the permalink.